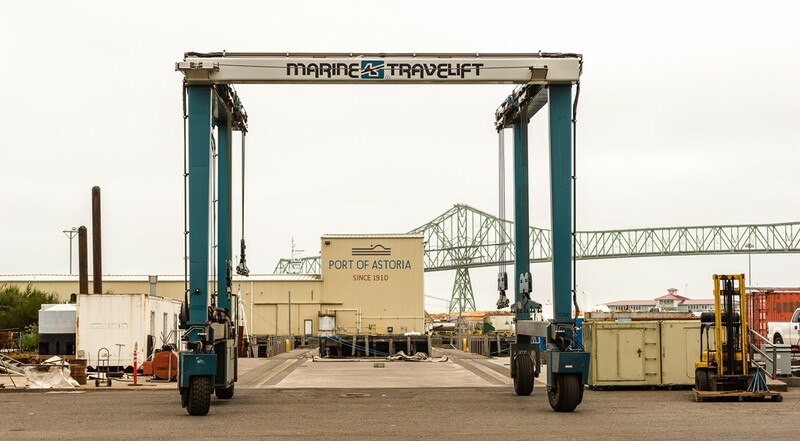 Located at rivermile 13 at the mouth of the Columbia River, the Port of Astoria's haul-out facility and ample boatyard are ideally situated for boaters from the Columbia River basin, and also serve West Coast boater traffic. In-water, upland storage, and long-term boat storage and trailer parking are available at rates significantly below those in urban areas. The facility includes an 88-ton TraveLift®, offering excellent lift efficiency and providing greater versatility when placing the vessel ashore for storage or repairs. A wash down system makes it easier to remove algae and barnacles from a boat bottom, and dispose of this material properly. Haul-Out Reservations are required, and may be made by calling the Marine Service Supervisor 8am to 4:30pm at 503-791-7731.